Jupiter is an area consisting mainly of single family homes and oceanfront condominiums. 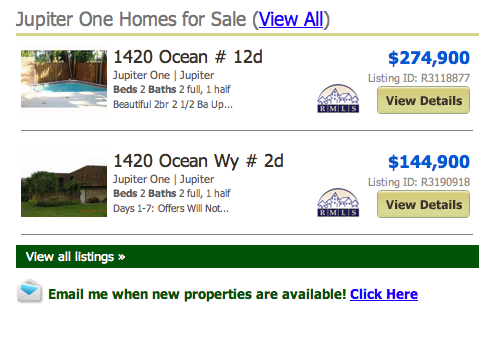 Townhouses, like the 128 units in Jupiter One, are rather rare and a location close to the ocean is even rarer. The design of the community is one that was quite popular several years ago with 4 units per building, each with its own entrance and patio. Community amenities include a pool and tennis courts. 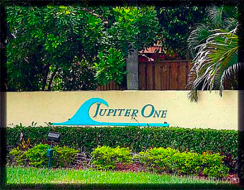 Jupiter One Townhomes online now. All listings & Sold Statistics! Townhouses in Jupiter One are located about 2 blocks from the famous Jupiter beaches and near a section which is “dog friendly” which means the family pet can join you on the sand. Jupiter One is also located near US One, the main artery for north/south traffic so you can head north less than 5 minutes to Jupiter attractions or south to Palm Beach Gardens. You might consider a townhouse here as a starter home or if you have small children. Most of the schools are “A” rated and Jupiter Elementary, Middle and High Schools are within a short drive. The central location also means that many Jupiter public facilities are very close. The Post Office, the Jupiter Medical Center and attending physician’s offices, the Public Library, the Town Hall, Jupiter Community Center and the North County Aquatic Center are just over the Indiantown Road Bridge. And you can access the other public facilities at Abacoa like the Town Center and Roger Dean Stadium within 10 minutes. The real treat though is living so close to our beaches. Starting in the north, you have the famous Jupiter Inlet with its 150 year old working Lighthouse. Across from the Lighthouse is Dubois Park, always a family favorite, the Inlet Park with oceanfront beaches and just a little further south is Carlin Park with its oceanfront pavilions, amphitheater and guarded beach. Posted in Jupiter homes, Uncategorized on June 12, 2011 at 12:44 pm.